Jim and Michelle decided it was time for a move. In need of a new place to call home, they contacted Ask Gina & Company to ask for assistance, and, of course, we were more than happy to oblige! After all, we specialize in the Northern Virginia area they were looking to settle in. After a few short weeks of searching, they ended up settling on this beautiful stone front home in Gainesville. From the minute they set their eyes on the house, they could already envision it as their home; and it only got better from there. From the beautiful gourmet kitchen to the extra space in the 3 car garage, this house seemed to have everything Jim and Michelle needed in a home. Every step through the house made them want it even more, and once they set foot on the screened porch, they were treated to a view they simply couldn’t refuse! They were sure that this was the house for them, so Team AGC got to work on making it theirs. Jim and Michelle in front of their new home! The sellers were happy to hear how much Jim and Michelle loved their home, as they wanted their house to go to new owners who loved it as much as they did. After a smooth settlement process with virtually no hold ups, the house was theirs. Jim and Michelle were over the moon, both with their new home and also with how easy the process was! Buying a home can be a tricky process; finding the perfect home for the perfect price is a daunting task. Sometimes, however, the pieces just fall into place. Before you know it, you could find yourself living in the home you never thought you’d be able to have. If you’re thinking about finding a place to call home, contact Team AGC. 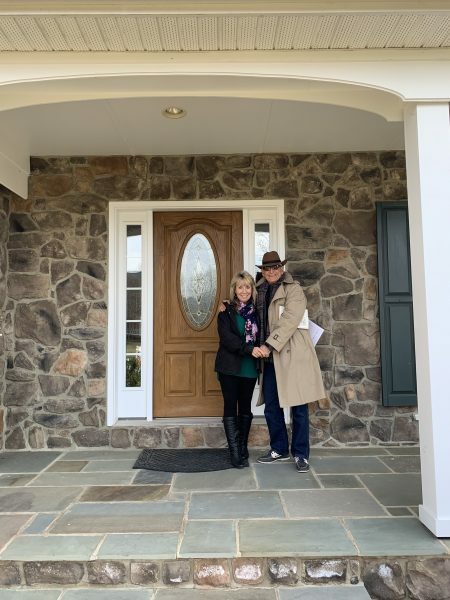 We’re eager to aid you in finding a new Virginia abode that will make you as happy as Jim and Michelle are with their new home!